This is rich! Very rich indeed!!! By now we should know better than to take the postmodern Left seriously. Facts - according to their world view, mere snippets of fleeting 'reality' - are irrelevant to them. Their quest isn't after truth either, but the creation of a string of impressions, the dissemination of memes on the perceptual level, the manipulation of gullible, immature minds on a simply grandiose scale, not seen since Corporal Hitler held sway over equally suggestible masses. We are holding an entire dossier here of rhetorical parlor tricks, of dishonestly moving goal posts in mid-debate, of erecting and taking down straw men, and of assorted other tricks held up the pomo sleeve. This rhetorical game of accusing opponents of senseless 'hatred' in an attempt to shut up the opposition through intimidation, is actually irresponsible in the extreme. On the other hand it would only be symptomatic that in a gesture of psychopathological projection they're pointing the finger at the opposition (this brilliant analyst has all but made political pathology her day job). Well, not after eight years of compiling evidence, you're not! 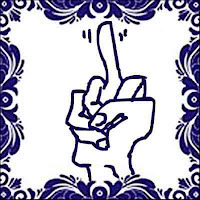 To a chutzpah as perpetrated by the SoroS lackey there's but one response: from Delft, up yours! - Pat Dollard: "New York Times: Conservative Media, Right Wing Extremism Responsible For Terrorist Agenda"
- Politeia: "The War on Existence"
- Politeia: "Politics=War in Action"
... or in the words of a lager lout, piling on the bullsh. Mousavi to O: Cut the Moral Equivalence! A Prague Spring for Iran?